I spent much of the weekend working on the piles that have accumulated over the past few weeks. The newspaper pile. I’ve always subscribed to two papers (the Tribune and the Elgin Courier-News), but for my Finance class, we also had to read the Wall Street Journal. I’ve actually grown to really like reading the WSJ – their foreign coverage is especially fantastic. 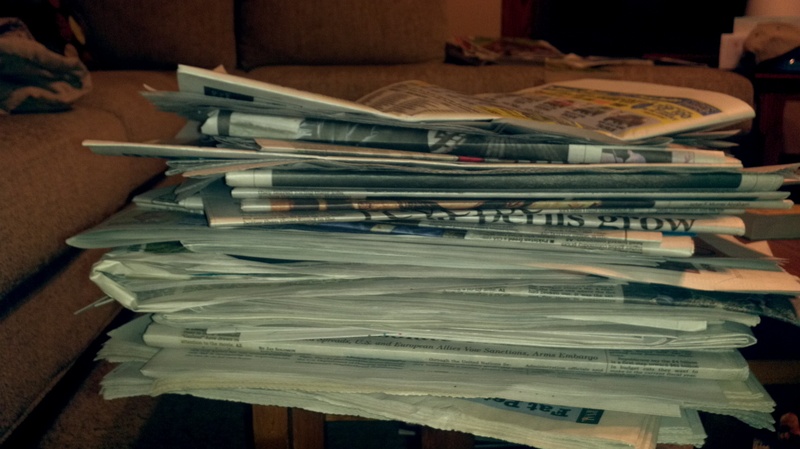 I just don’t have time to read 3 daily newspapers, yet I can’t bear to throw away anything unread. Every week for class, I skimmed through the relevant sections, setting others aside to read later. As a result, quite the pile developed on my coffee table. Digging through, I realized the bottom of the pile had a couple sections from Feb 9. 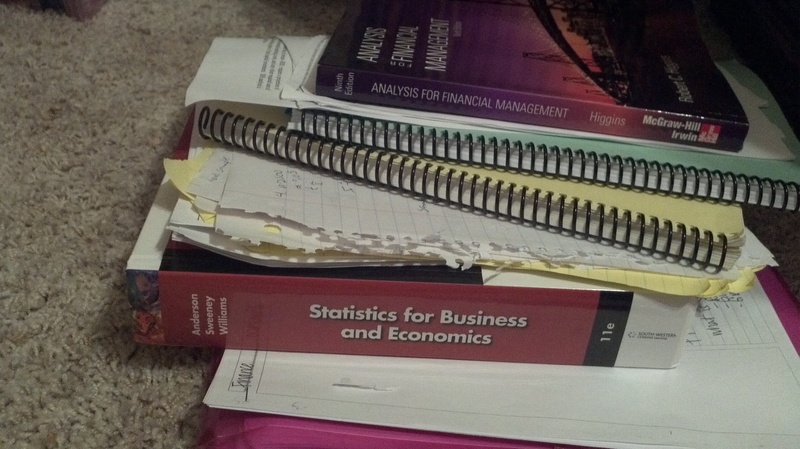 I cleared through much of it this weekend, and hope to kill off the pile entirely before classes resume on March 29. The library pile. During my Friday Free Day, before I got mired at the mechanic, I stopped by the library where I donated the 52 books i’ve been carting around in my trunk since January. I also picked out a few from my ever-growing list to read during my week off. I then proceeded to tear through all 294 pages of Stacey Ballis’ Room for Improvement before bed Friday night. (Granted, spending 4 hours stuck at the mechanic helped.) It was fabulously light and engaging, sugary enough to cleanse my palette of corporate finance terms and the quest for mu. 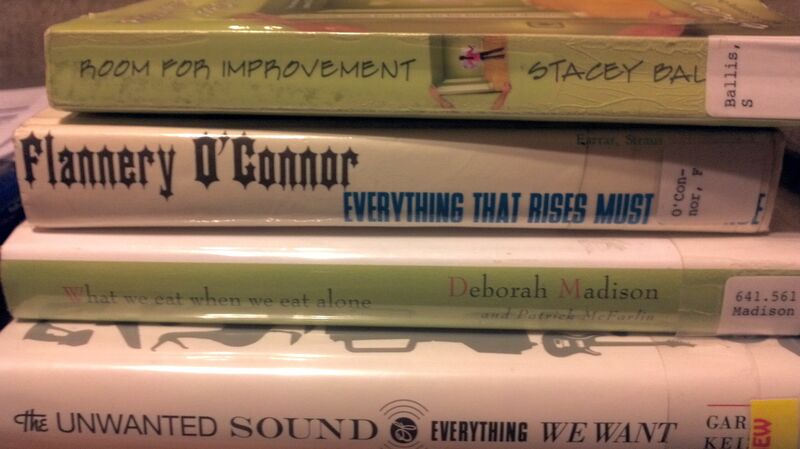 I also grabbed Flannery O’Connor’s Every Thing That Rises Must Converge (my other fiction pick), and two non-fiction pieces that received rave reviews: What We Eat When We Eat Alone (a sociology/cookbook hybrid) and The Unwanted Sound of Everything We Want: A Book About Noise. I hope to get through all before getting too bogged down by school reading. The Winter Quarter Cast-Off Pile. This one I didn’t touch all weekend. It hasn’t moved since Tuesday afternoon when I hit “send” on my Statistics final. I’ll probably lump all the loose paperwork into a folder and file on my “School” shelf, next to abandoned undergrad notebooks that I can’t bear to part with. After all, who knows when I’ll need my notes from Medieval Warfare, Springtime for Hitler or Wealth, Power & Virtue? The laundry pile. Nothing special, just the typical week’s worth of laundry. The Goodwill pile. Over Christmas break, I tried on every piece of clothing I owned and filled two boxes with things that are too big or I just don’t wear. After moving the boxes around my bedroom and the guest room, I finally took them to Goodwill over the weekend. The book pile. Also over Christmas, I rounded up about 50 books that have been stashed in the basement since I moved in. If I haven’t missed them in five years, I might as well donate them. The boxes made it to my trunk, where they’ve been riding around for weeks. Finally, Friday I dropped them off to donate to the library. This entry was posted in House projects and tagged Cleaning. Bookmark the permalink. You didn’t save the Goodwill pile for Frock Swap? I am hurt. Never fear, I’m sure there will be another closet purge before FS, especially once running season really begins.